PUT Sr Patricia Dent in front of any piano, but especially her 1970 Yamaha, and prepare to be whisked away on a musical adventure for at least an hour. The beloved Presentation Sister spends nearly every day tinkering on her piano in her living room at Caloundra Rise on the Sunshine Coast. Sr Trish can’t seem to stop her 10 fingers from dancing on the black and white keys, even at 100 years old. “Thank God I’ve still got the fingers,” she said. 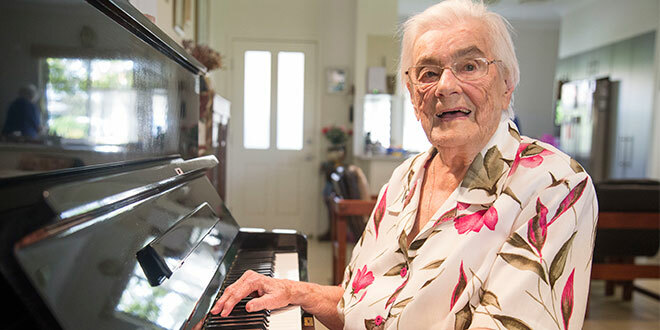 A household name in Lismore, Sr Trish taught hundreds of boys and girls – a large number on her 1970 Yamaha – and many have gone on to become some of Australia’s top composers, music teachers and music directors. They include Robert Gibson, former music professor at Hamburg University in Germany who now works for the Tasmanian Symphony Orchestra; Robyn McKelvie, the wife of country music legend Lee Kernaghan; retired director of the Tamworth Regional Conservatorium of Music Jane Robertson; St Laurence’s College music director Anthony Young; and John Willems, the “genius” brother of Australian composer Gerard Willems. Her pupils have been sending messages of praise and thanksgiving to the 100-year-old nun from Lismore who spurred their passion for music. “It’s a bit overwhelming when I think of all the wonderful things they’re saying to me,” she said. Music and her family are among Sr Trish’s five secrets to living a long life, along with 79 years as a religious sister, the joy of teaching, and the love and attention from her carer of more than a decade, 83-year-old nurse Jan Rowland. But music may be her top secret to living to 100. “Music has played a very big part in my life and I really think that maybe it’s the music that’s kept me young,” she said. Sr Trish caught a love for music from her mother Mary Dent, who was dubbed “the mother of music in Lismore”. Among Sr Trish’s hundreds of compositions are at least three Masses, including one for the Latin Mass, and children’s songs for use in Catholic schools. Her first Mass was a three-part Mass written for Mother Agnes and sung at St Carthage’s Cathedral on St Patrick’s Day in 1953. While she handwrote much of her work, in her late 80s Sr Trish digitised her work using Musicator, a notation computer program, and a digital keyboard. 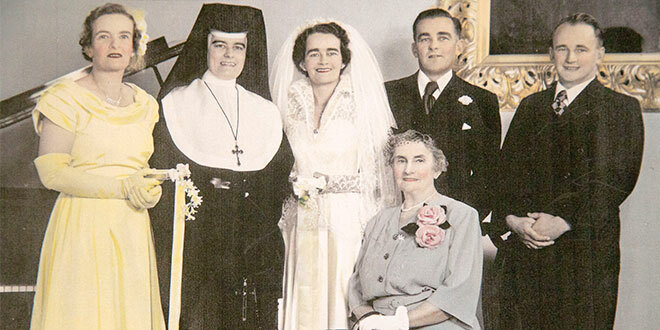 Family love: A fully-habited Sr Patricia Dent celebrating the wedding of her sister Dorothy with her siblings and mother Mary Dent, known as “the mother of music in Lismore”. Sr Trish, born Marie Therese Dent in 1918, was six years old when she took her first piano lesson from a friend of her mother’s who “used to put a penny on my wrist”, a method she personally would never use. “When I was playing, if I kept the penny on my wrist, I could keep the pennies,” Sr Trish remembers. Several years later, Sr Trish was leaving school early to perform in “a big eisteddfod in Lismore”, running past Mother Stanislaus D’Arcy, the Irish nun sent to start the Presentation Sisters’ Lismore mission in 1886. “I can remember her sitting out in front of that convent one day when I came up to the convent to say they had a big eisteddfod in Lismore,” Sr Trish said. Mother Stanislaus called the young girl over and asked where she was going, and Sr Trish told her she was off to the eisteddfod. That encounter with the first leader of the Lismore Presentation Sisters means Sr Trish has known every single superior general of her congregation. “I think I’m about the only one who has known every major superior of our congregation,” she said. When she was sent to boarding school with the Presentation Sisters as a 10-year-old girl, she decided straight away she was joining the congregation. “That was the end of me; I never wanted to do anything else,” Sr Trish said. On her 20th birthday, she “stupidly” confessed to her mother, who was busy organising a concert party, that she wanted to enter the convent. Her mother’s only request was that she wait until she turned 21. “When I was 21 I came,” Sr Trish said. “I can remember the day I entered – we walked from my home up that street to the convent on the 31st May, 1939. Not bad, ay? Sr Trish is making history as the first sister from the Lismore congregation of the Presentation Sisters of the Blessed Virgin Mary to turn 100. She taught and prayed in Lismore for most of her 79 years of religious life, except for six years in Murwillumbah, three years in Croydon, Sydney, and 20 years in Ballina. In 2011, she received the Order of Australia medal for her service to the Church and children’s music. She has lived in a retirement village for the past 10 years and is the only nun in the complex. “Thank God I’m as good as I am,” Sr Trish said. “I don’t know what’s ahead of me but that’s in the Lord’s hands. “I didn’t say to myself, ‘now, you’ve got to live another ten years’; it’s just happening and I’ve been so happy.